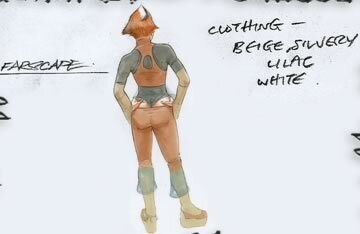 Not as much as we'd like to offer, but it's a lil' glimpse: an early concept sketch, a few costume sketches, a pic of the transformation at work and on set - what a creative process it is! 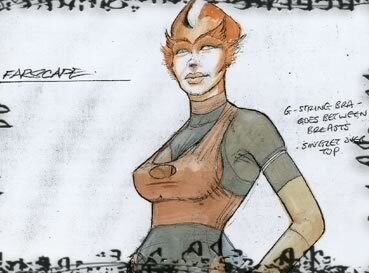 First, the idea they originally had in mind for Chiana was totally different! 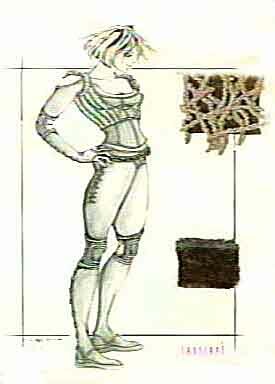 Here are 3 frames from an early concept sketch of Chiana, BG (before Gigi) and Leslie Vanderwalt (makeup) had at it. 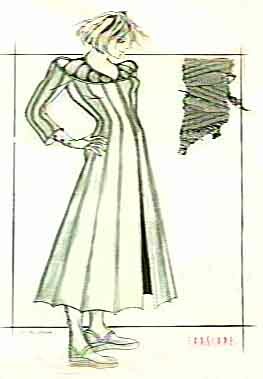 Gigi being transformed into Chi. Amazing, no? In order to produce a dimensional, convincingly textured appearance of skin instead of a flat pale paint, multiple layers of paints, one atop and/or overlapping another, each of varying shades and, yes, color tints, are painstakingly applied before every shooting day. See frames from the Chiana Makeup Reel. 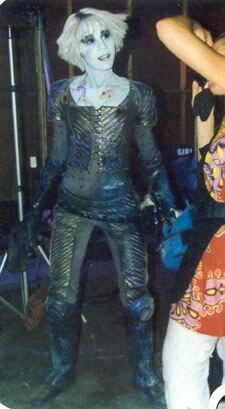 This is the first footage of Chiana, made for production purposes (such as to see how it looked on screen with lighting and make further adjustments from there). Finally here's Gi, made up as Chi, who has arrived on the set of ep. 50, "Eat Me" ready and hoping to play.